Borage seed contains high levels of Gamma Linolenic Acid (GLA). GLA is a naturally occurring fatty acid marketed as a dietary supplement and in cosmetics. Enzol has considerable expertise in the growing and marketing of this crop. We have achieved excellent result in Borage Seed production. Our growers are selected for their abilities to grow Borage Seeds, their farm locations and soil types, along with the availability of irrigation and/or good rainfall areas. 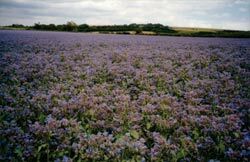 The company manage all aspects of Borage Seed production from seed stock production to post harvest storage, cleaning, packaging and marketing. Packaging: 25kg poly prop bags or 500kg bags. To arrange seed multiplication please contact us here.